I stand here today humbled by the task before us, grateful for the trust you have bestowed, mindful of the sacrifices borne by our ancestors*1. I thank President Bush for his service to our nation, as well as the generosity and cooperation he has shown throughout this transition. 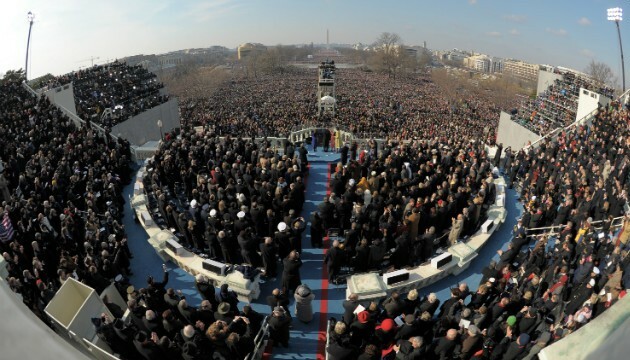 Forty-four Americans*2 have now taken the presidential oath. The words have been spoken during rising tides of prosperity and the still waters of peace. Yet, every so often the oath is taken amidst gathering clouds and raging storms. At these moments, America has carried on not simply because of the skill or vision of those in high office, but because We the People have remained faithful to the ideals of our forbearers, and true to our founding documents. We remain a young nation, but in the words of Scripture, the time has come*5 to set aside childish things. The time has come to reaffirm our enduring spirit; to choose our better history; to carry forward that precious gift, that noble idea, passed on from generation to generation: the God-given promise that all are equal, all are free, and all deserve a chance to pursue their full measure of happiness. In reaffirming the greatness of our nation, we understand that greatness is never a given. It must be earned. Our journey*6 has never been one of short-cuts or settling for less. It has not been the path for the faint-hearted – for those who prefer leisure over work, or seek only the pleasures of riches and fame. Rather, it has been the risk-takers, the doers, the makers of things – some celebrated but more often men and women obscure in their labor, who have carried us up the long, rugged path towards prosperity and freedom. For us, they packed up their few worldly possessions and traveled across oceans*7 in search of a new life. For us, they toiled in sweatshops and settled the West*8; endured the lash of the whip and plowed the hard earth*9. For us, they fought and died, in places like Concord and Gettysburg; Normandy and Khe Sahn*10. For as much as government can do and must do, it is ultimately the faith and determination of the American people upon which this nation relies. *11 It is the kindness to take in a stranger when the levees break, the selflessness of workers who would rather cut their hours than see a friend lose their job which sees us through our darkest hours. It is the firefighter’s courage to storm a stairway filled with smoke, but also a parent’s willingness to nurture a child, that finally decides our fate. Our challenges may be new. The instruments with which we meet them may be new. But those values upon which our success depends – hard work and honesty, courage and fair play, tolerance and curiosity, loyalty and patriotism – these things are old. These things are true. They have been the quiet force of progress throughout our history. What is demanded then is a return to these truths. What is required of us now is a new era of responsibility*12 – a recognition, on the part of every American, that we have duties to ourselves, our nation, and the world, duties that we do not grudgingly accept but rather seize gladly, firm in the knowledge that there is nothing so satisfying to the spirit, so defining of our character, than giving our all to a difficult task. This is the meaning of our liberty and our creed – why men and women and children of every race and every faith can join in celebration across this magnificent mall*13, and why a man whose father less than sixty years ago might not have been served at a local restaurant*14 can now stand before you to take a most sacred oath. America. In the face of our common dangers, in this winter of our hardship, let us remember these timeless words. With hope and virtue, let us brave once more the icy currents, and endure what storms may come. Let it be said by our children’s children*16 that when we were tested we refused to let this journey end, that we did not turn back nor did we falter; and with eyes fixed on the horizon and God’s grace upon us, we carried forth that great gift of freedom and delivered it safely to future generations.